Customer experience in it's all forms is my favorite subject. I love to analyze how things could be done better and what makes a good or bad customer experience. 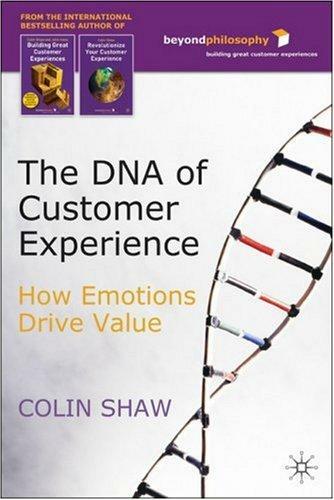 Lately I got my hands on the book DNA of Customer Experience by Colin Shaw. It's about the emotional side of Customer Experience. It was a really exciting book experience for me. Book introduces four major categories (or clusters as called in book) of emotional states, which affect customer experience. Those categories are explained really well with many good examples. Those categories are further broken down to emotions. Emotions in those categories really seem to make sense and finds a true counterpart in real life situations. This gives a good start to deeper understanding the meaning of emotions to customer experience and business figures. The categories introduced in the book are Destroying cluster, Attention cluster, Recommendation cluster and Advocacy cluster. Most of those are quite self-explanatory. In the Destroying cluster are the feelings when people are disappointed and frustrated towards a service or a product. Those are the worst ones and maybe the easiest to fix. Then on the other end there is the Advocacy cluster, in where are the feelings to really feel belonging to something. It's the most happiest feelings towards a service you can get. What I like in this book is, that it acknowledges that improving customer experience might need a strong business cases behind those activities. In order to get support from management there might need to be prove that it helps the business. The book makes a business case out of almost all examples. Some of those seems a bit artificial, but at least there are numbers behind improving customer experience. Those might really count in some organizations. I've been a big believer of emotional side of customer experience already before reading this book. This was the book that gave me lot more facts on top of my own thinking. Emotions are really important when dealing with people. Even you give a good service, you might be missing something to really affect the person. In many business areas this is vital. People can be really loyal, when they have a good reason for it, or then they can swap between companies, if they are not emotionally attached to it. Emotions really matter. If you don't believe it, read this book. My only criticism towards the book, is that it uses a lot of Beyond Philosophy's methodologies and terminology on measuring customer experience with emotions. This means that you can't really implement these things directly to your business, but you should actually buy the services from them. So there's a slight taste of marketing material in this, but you should get over it, due the actual content of this book is so brilliant and important. I really recommend this book to everyone. This book is the key on understanding why some services or products just feel better than others. Even you wouldn't be directly involved in dealing with customers, you should read it. This is such an important book to understand what customer experience is all about.